Ever since the block-buster two-part Borg cliffhanger that ended season 3 and started season 4, Star Trek fans wondered how the franchise would ever top that. 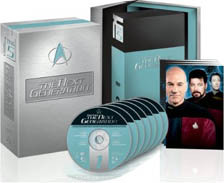 Even today, some polls suggest that perhaps they never did - at least, not in terms of TNG TV episodes. The question became particularly acute each time another season attempted to end on a cliffhanger to be resolved by the opening episode of the subsequent season. In that respect, I think "Redemption" stands out as a damn fine effort, being a completely different and unique story that doesn't copy "The Best of Both Worlds" in any major way, yet has enough of its own highly-charged intrigue to be truly worthwhile as a cliffhanger. Good job. To be fair, a lot of the impact depends on the viewer having seen a fair amount of the show previously, as it draws on a lot of prior story threads. At this stage after four seasons, that isn't such a bad thing. If any thing feels weird about it, it is that 3/4 of a Federation year has passed between "Reunion" and the opening of this episode, when it seems it would have been more natural for the events of the opening to have been an immediate follow-up. Oh well. This won't hurt things too badly. Although this story doesn't quite manage to mention the Prime Directive by name, it heavily discusses the non-interference policy of the Federation at the widest scope it will probably see - concerning relations with its two largest rival interstellar organizations. As long as there is dissent only within the Klingon Empire, they believe they must remain uninvolved. However, if the Romulans are found to be meddling in the conflict, the Federation will see fit to weigh in as well. In many ways, this finally clears up a few points that have been hounding The Prime Directive since first season Next Generation stories like "Too Short A Season". Good. On the other hand, is the philosophy here truly more enlightened than the disaster witnessed in "A Private Little War"? I think we are on good ground in "Redemption", in that the Captain feels at home in respecting the wishes of the past Klingon leader in arbitrating the succession, but resists armed combat. And even when prepared to do more in the end, they still never actually get around to fighting - spending their time instead exposing secrets. All good. Pretty much all of the non-interference discussions are over and done with in the first episode, but even in the second, the plot is still hinging on the Federation's position on the issue. I must say, one point I found quite strange was the sudden escalation from a basically diplomatic story centering in the High Council Chamber in the Klingon Capital City to a space battle fought with armadas of ships - the geography of the conflict seemed like it didn't really need to go beyond a few city blocks of the Council Chamber to be decided, at least not unless the principle figures of one side or the other make a desperate escape and then need to fight their way back to the Capitol. Additionally, the declaration of the Capitol City as "neutral territory", where one can drink with one's enemies before returning to attack his spaceship with one's own... is all a bit too weird. It pretty much takes all logic out of the logistics of the war, and impedes the structure of goals vs. barriers in the main plot, defusing audience interest and emotional engagement in the tale. Thankfully, the Federation/Romulan portions are still working well enough to hold everything together. The second episode actually reopens a time-travel conundrum from a previous episode. What is interesting about this particular piece of backstory is that, as far as the regular Next Generation characters are concerned, it was one of those "Adventures That Never Happened". Notice how much more awkward it is for them to deal with it now, as they can't even talk about it properly. This should be another good nail in the coffin for writing those kinds of conundrums in the first place. Thankfully, Guinan has some sense of what happened, but even then, she remains far less articulate than a proper exploring "slider" ideally should be. Season 5 of the Next Generation is, in my opinion, the year of gimmicks - and I don't mean that in a particularly bad way, just an honest one. Season 5 is full of ideas with great marketability, meaning it was excellent at getting people excited about the episodes and getting them to tune in and watch. It was a bit more hit and miss as to whether those ideas actually produced satisfying stories. Denise Crosby as "Sela" is really the first season 5 gimmick. Though her character works well within the main plot, the story beat of her coming aboard the Enterprise D just to babble on about her backstory feels a bit too tacked on and out of place in this narrative, though of course fan interest would and does demand it be dealt with. The biggest flaw in "Redemption" is probably the simple fact that the Enterprise crew largely feel like bit players in this story. Troi and Dr. Crusher have virtually nothing to do at all, while Geordi's contributions don't come about until the second half. Even though Riker gets his share of lines and scenes, he remains on the periphery of the story's concerns. This really is a story for Picard and Worf, focusing on these two quite heavily and successfully. Data at least gets an interesting sub-plot in the second half, but its emotional subject matter feels a bit too forced. On that note, one wonders why the Federation is able to supply so many ships that have crews but no captains of their own. This is truly bizarre and awkward, and something that I don't think is ever repeated anywhere else when Star Trek has shown multiple ships getting together. This would be a great situation for Picard to be promoted to Commodore, where he still commands Enterprise D, yet also outranks all those other captains. Having him continue to outrank the leaders of all the other ships simply because none of them are captains... not so believable. At any rate, one really good thing about this story is that we finally get off of the Enterprise D for a bit, and get plenty of scenes in other places - something that modern Trek didn't do nearly enough of. "Redemption" excels in that, and should be celebrated for it. All in all, this is one of the good stories of The Next Generation that you can't afford to miss. Enjoy. "Redemption" is available as an edited-together movie on Blu-ray. 1 movie @ 86 minutes. Audio Commentary by writer Ronald D. Moore and scenic artists Mike & Denise Okuda. "Survive and Succeed: An Empire at War" documentary (30 min.) 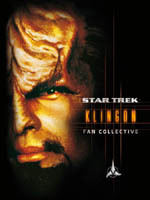 including Michael Dorn (Worf), Robert O'Reilly (Gowron), Gwynyth Walsh (B'Etor), Ron Moore, and others. with English, German, French, and Japanese audio tracks. 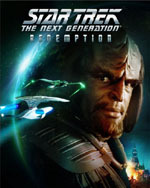 Both episodes of "Redemption" are available in the Star Trek Klingon standard DVD box set. 13 episode "hours" @ 45 minutes each. which include cast and crew interviews discussing the creation of the episode. Includes 26 episodes @ 45 minutes each. July 30, 2013. Blu-ray U.K.
"Brothers" by director Rob Bowman and scenic/graphic artists Mike and Denise Okuda. Brannon Braga, and the Okudas. Multi-part documentary "Relativity: The Family Saga of ST:TNG" (HD, 60 min.) 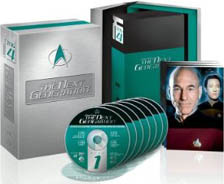 with Patrick Stewart (Picard), Jonathan Frakes (Riker), Brent Spiner (Data), Michael Dorn (Worf), Gates McFadden (Dr. Crusher), Wil Wheaton (Wes), Ron Moore, and make-up artist Michael Westmore. In Conversation: The Art Department (HD, 65 min.) with designer Hermann Zimmerman, the Okudas, make-up artist Doug Drexler, and visual effects supervisor Dan Curry. "Redemption" - PART TWO ONLY - is available in the standard season five box sets. Read the next Star Trek review: "Darmok"